The majority of wholesale growers in the United States sell a variety of types of material in a variety of sizes and formats. In terms of shipping the material, that presents challenges, but each nursery is different. While all growers must pay attention to the cost and availability of freight, as well as the labor costs for loading, not all of them load or arrange their truck or container loads in the same way. It all varies depending on what’s being shipped, as well as the loading procedures each grower finds best for their product line and situation. Some opt for the traditional “California stacking” of containers inside the truck or container to maximize payload per footprint. Others who ship shorter material can make use of racks that maximize vertical space and protect delicate plants. And yet others are making greater use of pallets for easy loading and unloading. As growers consider and reconsider these options, they’re also looking at their own operations, and what happens on the ground, before material enters the truck or container. Many are scouring work routines to find the efficiencies that will help them get the most from the shipping process. Looked at only for its efficiency, racking or palletizing nursery products, especially smaller material, is almost a perfect system. “When you look at it, with a one gallon, you can get over 80 percent of the same number of units on a truck palletized as you can get stacked,” said Mike Lee, a former Oregon grower now working with plant brokers Listerman & Associates in Xenia, Ohio. Then there is the loading and unloading time when racking, and the labor required to do it. “If you look at just the labor cost, at $15 per hour average, versus stacking with a three- to four-person crew and two to three hours to load a truck, it’s an advantage,” Lee said. With palletized stock, you could load with one person, he said. Plus, with perennials and delicate types of plants, you’re less likely to have damaged material on the receiving end of the shipment. Racking became the goal at Bailey partially because it gives the nursery control over labor. When plants are racked, the variable schedule of a driver has less impact on day-to-day operations, and the loading takes a lot less time and effort. Being palletized makes the plants much more attractive because the trucker is not sitting for hours both picking up and dropping off a load. Racking provides flexibility in scheduling labor resources to readying material to ship. Plus, racks don’t require the same kind of load-securing as pallets, Brockshus said. Bailey is even experimenting with using curtainside (soft-sided) trailers for local delivery to maintain plant quality and consistency and yet increase efficiency. The challenge for container trees and bareroot is loading the plants so they’re leaned in and propped up. This way they are more likely to look presentable at journey’s end. This challenge has prompted Bailey to begin testing a prototype pallet to ship container trees to its Minnesota nursery. The nursery will continue to tweak and work out the kinks until it decides on a product that works efficiently, and then it will try to palletize bareroot material. How the racks will be retrieved is a question to be answered later, Brockshus said, as the nursery works first on finessing the system for racking larger material by continuing to test it internally. One of the biggest considerations for most nurseries is the cost and fate of racks and pallets after delivery. By his latest calculations, working with a non-profit that employs individuals with developmental disabilities, Lee figured it’s roughly $60 per rack for a four-to-five-shelf rack. It’s not unusual, then, for the cost of a shipment to include $1,500 for the racks alone, he said. Whether racks and pallets make economic sense depends on your client base, Lee said. Those nurseries with big box store clients use reusable pallets that they lease through one of a few companies, he said, that pick them up. Recycling the wooden pallets is another alternative. Independent garden stores with lower volume orders don’t warrant a stop by these companies picking up pallets. So, if it’s a wooden rack, it’s up to the customer to handle disposal, which puts a burden on the customers to break them down or find a way to repurpose them. Plus, customers can be relegated to placing a minimum order if plants are racked to fulfill truck-loading sequences, which is inconvenient and perhaps impossible for lower volume customers. At A&R Spada Farms (St. Paul, Oregon), which sells to independent garden centers and resale wholesalers, none of the stock is palletized because of the cost, sales manager Vinny Grasso said. The loads are floor stacked, which provides the best payload and maximizes square footage and weight, Grasso said. The on-site scale allows the nursery to make sure the trailer weight is legal and capacity fully maximized, and if there is room, to slide the axles and add more weight and get more product out in one shipment. The nursery also brought in an outside consultant, a process expert, last year to start a step-by-step review process for organization flow, from pulling orders to staging and loading. And things improved. “With shipping, the goal was twofold, to improve productivity and improve overall execution and quality to the customer,” Grasso said. The company can now do more with fewer people. 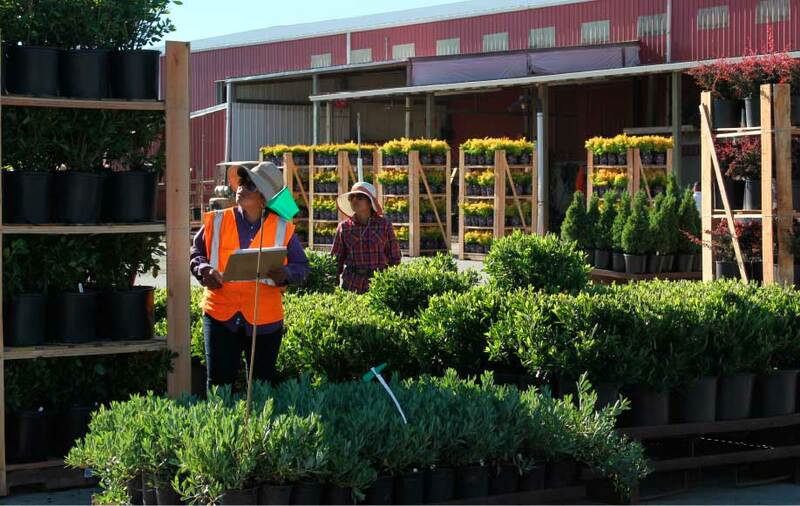 Unnecessary processes were eliminated, which has helped ensure only the best plants reach the loading area and the nursery maximizes labor efficiency. With the people they have, they are also looking at ways to embrace technology and equipment to help their labor force. For instance, with an aging workforce and a workforce dominated by women, Grasso said, they shifted to using more track hoes to move product. Smith Gardens is a wholesale nursery that delivers to box retail stores, with farms in Washington, Oregon and California. Their products range from annuals to hanging baskets and potted shrubs to ground covers. Everything is racked. The nursery has its own trucks and trailers that it leases seasonally, and they make an effort to make the whole fleet the same size. Wes Bailey is site manager of Smith’s large operation in Aurora, Oregon, which just underwent a significant expansion. The company made large investments in technology and process improvement in order to make the shipping process more cost effective. With standard truck sizes, the nursery can use metrics to match loads to truck size. This means the transportation department can rely on the same number of racks going into each trailer when they are writing orders. “If transportation knows it is all the same, it makes it easier to cube out that trailer and maximize the load,” Bailey said. To affirm that the new system is more efficient, the company tallied its monthly miles driven and flats shipped. The result? “We’ve delivered more product and driven less miles this year,” Bailey said. Smith Gardens has also been in an active Lean improvement process since 2012, whereby processes are mapped and studied to reduce steps that don’t add value to the final product. This has allowed the nursery to reduce labor by 20,000 work hours annually. Lean and continuous improvement gave the nursery the tools to evaluate processes and identify the waste and then eliminate it. “A big piece of it was software programming,” Bailey said. The nursery enhanced its software and shifted the staging process to use numbers rather than plant names. Bulk orders are pulled from the greenhouse, and the pulling crew applies a sticker from the shelf to the rack. When the racks come to the staging crew, they match the number of the product to the destination, without having to know the type of plant. With Lean practices, the nursery involves all levels of workers to map out current steps and continue to eliminate waste. “There are always ways,” Bailey said. For instance, a benefit they found with rolling racks is that orders can be filled in the greenhouse and be moved straight to the truck, skipping the staging process. That means looking at processes more with a manufacturing view than just as plant growers, Bailey said. Shipping has been the perfect place to start looking and to engage the Lean process, Brockshus at Bailey Nursery said. And the sense is that racking and palletizing will continue to be considered by nurseries as a shipping method.